The patio has a lot of potential. It’s a shame not to make the best you can out of it. Therefore, take advantage of what the patio has to offer and create your own unique patio. If you are looking for some ideas to inspire you, read the following lines. The unique patio designs that you will find here will definitely give you some great ideas to use for your own patio design. 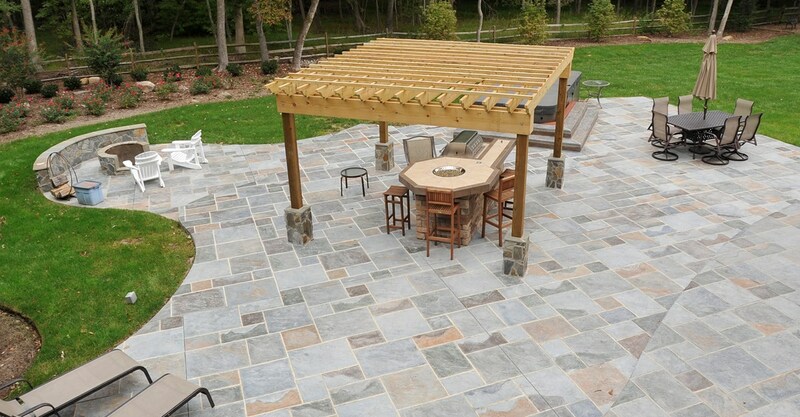 A concrete and paver patio like the one shown in the image above is a clean and spectacular addition to any home. If you have enough space, recreate the scene shown above. Install a covered bar with high chairs at the center of the patio. Put a table where you sit and eat when the weather is good. Make sure that the table has a spot to stick an umbrella. When the blinding sun invades, you can open the umbrella to stay protected from it while you eat and drink. 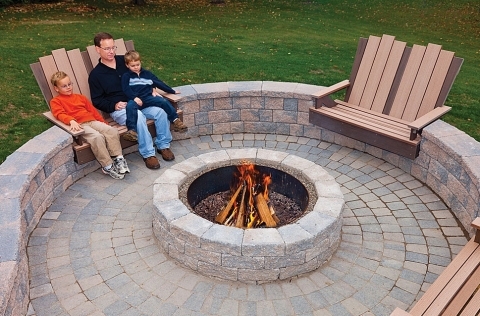 On the opposite side of the table, you can put a small firepit with some chairs sitting around it. This place will be great for those cold summer nights in which you’re in the mood to talk with your loved ones. Also, if you can afford it, install a jacuzzi here. It’s extremely fun to use it, and it’s a luxurious addition to your spectacular patio. To keep warm, you can hang the Infratech Dual Element Electric WD4024SS infrared patio heater on the gazebo or construction that you used to cover the bar. The WD4024SS is one of the top picks of Bestheater.reviews, which says a lot about this heater since the BestHeater.Reviews website is very thorough when it comes to analyzing and comparing infrared heaters. With the help of the infrared patio heater, you can use this space even when it’s cold outside. 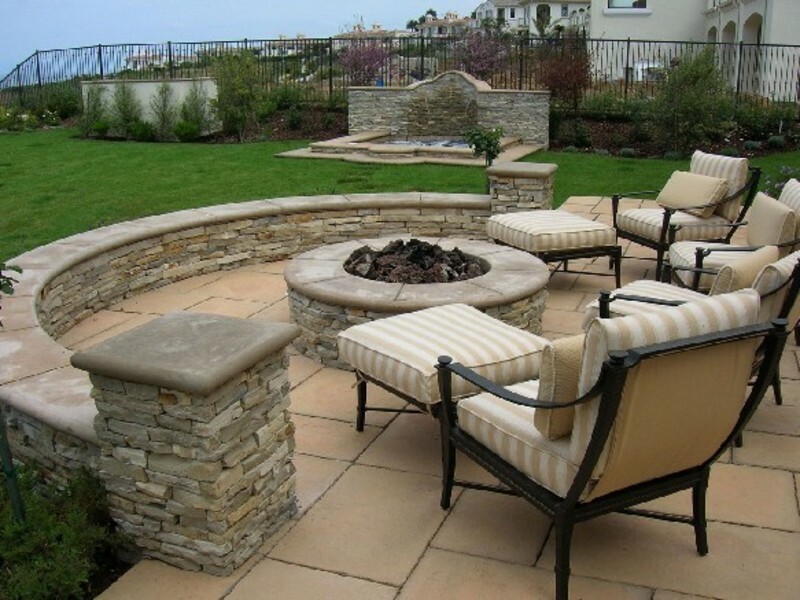 The pit fire patio shown in the picture above has a simple, but spectacular design. All that you need for it are a pit fire and some chairs to lay around it. In this simple and amazingly functional patio, you can sit when those cold summer nights come. You can prepare food with the help of the pit fire and tell scary stories to your children. Also, you can throw amazing parties like in the 1970’s. You and all your friends can gather around the pit fire and sing songs on your guitars. The stone patio design shown above is nothing but pure genius. Integrate 2-3 benches in a stone wall. Pave a circle form for the patio from stone, and place a firepit in the middle of it. It’s great for parties, or for sitting in the cold summer nights with your lover. As you can see, a simple design can be truly spectacular if you make the right arrangement. Therefore, don’t hesitate to use this design yourself.